Take out a subscription to Slimming World Magazine, the inspiring, glossy magazine from Slimming World, the UK's most advanced weight loss organisation. Slimming World is dedicated to making your slimming journey as easy and enjoyable as possible, and helping you maintain your dream weight for life. 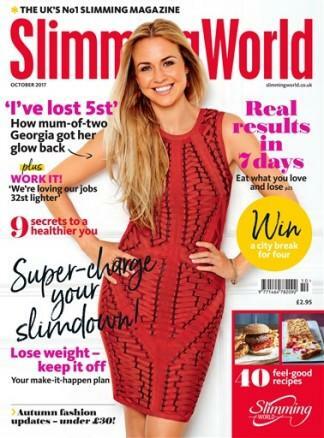 In every issue of Slimming World you?ll find: - Amazing success stories from women and men of all ages to inspire you to success. - An exclusive 7-day eating plan to super-charge your weight loss and take the hard work out of menu planning. - 40+ pages of fabulously filling family-friendly recipes for the extra special and the everyday. - Take-charge tactics and savvy seasonal strategies to help you stay on track. - The very latest nutrition and health information to help you make informed choices. - Fitness ideas, road tested by real slimmers, to help speed up your weight loss. - Expert fashion and beauty advice to help you love the body you've got now, as well as the one you're working towards. The principles of Slimming World are that members lose weight through a combination of the Food Optimising eating plan, moderate activity through the Body Magic programme and group support and shared experience with other slimmers, which all help to encourage behaviour change. Subscribe today and find out why Slimming World is the UK's fastest-growing slimming magazine! Be the first person to tell us what you think about Slimming World (UK) and you'll save $5 on your next purchase!